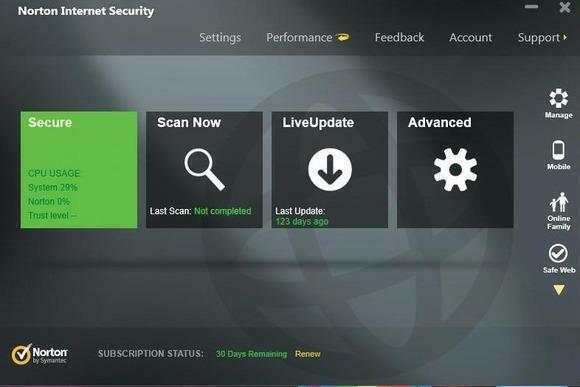 Norton's Internet Security 2013 software works well, is quick and easy to install and use, and doesn't slow down your computer. As antivirus and security software suites go, it's great. Symantec’s 2013 edition of Norton Internet Security (AU$69.99 for one year and three PCs, or AU$135.99 for two years and three PCs) is a solid performer with a polished, touch-optimized user interface. This security suite didn’t totally dominate its competitors, but it did completely block, detect, and disable all malware in our real-world tests, and it performed well enough overall to snag second place in our roundup. Norton’s excellent showing in our real-world attack test indicates that it should be effective at blocking brand-new malware attacks as it encounters them in the wild. As noted in the F-Secure review, of the security suites we tested, four others were also successful at completely blocking 100 percent of attacks: Bitdefender, F-Secure, G Data, and Trend Micro. Norton produced stellar—though not absolutely perfect—results in detecting known malware. In our malware-zoo detection test, the program successfully detected 99.8 percent of known malware samples. Norton Internet Security also put up a perfect score in our false-positive test: It didn’t mistakenly identify any safe files, out of more than 250,000, as being malicious. Norton does an acceptable job of cleaning up a system that has already been infected, but it missed some infections completely in our evaluation. In our system cleanup test, the program detected and disabled 90 percent of infections, and completely cleaned up 60 percent of infections. This is a decent but not fantastic showing—seven of our tested suites detected and disabled 100 percent of infections, and six cleaned up all traces of infection at least 70 percent of the time. On the other hand, Norton Internet Security is a relatively lightweight program that won’t bog down your system. It added about half a second to startup time (compared to a PC that had no antivirus program installed), and also added 3 seconds to shutdown time; in all of our other speed tests, it was faster than average. Norton is faster than average when it comes to scanning speeds, as well. The package required just 1 minute, 19 seconds to complete an on-demand (manual) scan, and 2 minutes, 55 seconds to complete an on-access scan—both are times that represent better-than-average results. Norton’s interface is very polished and simple, and the program installs with just one click. The main window has tilelike buttons, which look designed to work well with Windows 8 touch systems. You’ll find four tiles on the main screen: a tile that shows your protection status, along with information about your CPU usage; a ‘Scan Now’ tile; a LiveUpdate tile (which you’d use to install any updates to the suite); and a tile for advanced settings. You can also access the settings via the Settings tab, which is located at the top of the screen. The settings menu is relatively easy to navigate, though it has more options than a beginning user really needs. Still, Norton does a good job of explaining different features and toggles, and a little help button (which takes you to Norton’s online support site) is always located next to confusing terms. The 2013 version of Norton Internet Security is definitely worth a look, especially if you’re a Windows 8 user. Australian Editor’s note: We gave Norton Internet Security 2013 a run for two weeks on three home PCs, each getting daily usage. It’s such a lightweight piece of software that we didn’t notice any additional boot time for the systems — one of which is an overclocked Windows 8 gaming PC with an SSD, one is a general purpose Windows 8 laptop with a mechanical HDD and the third is an older PC running Windows 7. The software successfully cleaned a USB flash drive that was infected with malware, and alerted us a few times when we’d downloaded software that was suspicious or came from untrusted sources. It’s generally unobtrusive until it spots something wrong, then chimes in to tell you not to continue. The price of the software’s annual subscription is, in our opinion, entirely reasonable. If you use it on all three PCs covered by the licence — and we’d assume most houses have more than one — it’s only around $23 for a year, and less if you commit to two years. We liked the added security that Norton Internet Security 2013 brings to a Windows 8 PC, above and beyond Microsoft’s baked-in programs and tools. We’d happily pay for this software and we’ll continue using it over the licence period.